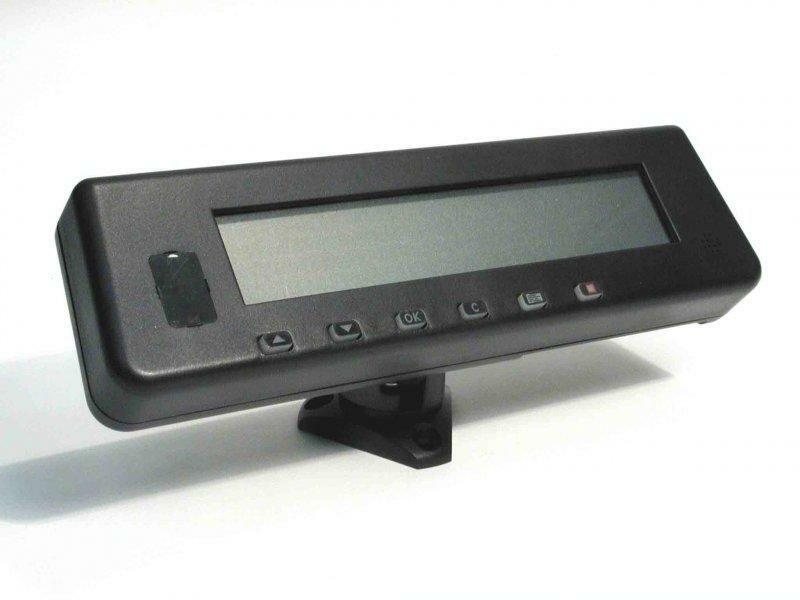 This multi-functional display joins ergonomic and nice looking design to outstanding performances and prices. Suited to any kind of vehicles with no additional equipments (thanks to its wide range input power supply) it allows to implement any king of logistic and security feature (from driver recognition to messaging and “radio-tagging” functions, etc.) with the highest integration level and the lowest price to performance ratio. 40 characters for 4 lines display with back light. 5 configurable programmable function buttons. Programmable Code for personalised functions (Pin Codes), entered either by a suitable sequence of the integrated buttons or by the (optional) Infrared keypad or any (optional) external keyboard. Vehicle printer connection possibility, when supported by the connected unit. Bidirectional free messaging capabilities (when supported by the connected unit): alphanumeric free text may be entered either from the (optional) Infrared keypad or from any (optional) external keyboard. Work flow and breaks management capability. (Optional) dialing capabilities for private calls, if the AK TST F1T IR keypad is used. (Optional) predefined service request capabilities, as per iconised buttons, if the AK TST F1T IR keypad is used. Units diagnostics and test capabilities, with access through specific protection passwords, to check input /output, on board system status and GPS receiver with coordinates indications.